I’m so excited to be knitting with you all for our first Knit-A-Long! Starting from Thursday 30th October for six weeks you can join me, Monica Russel, the fabulous pattern designer behind this beautiful baby set and a community of knitters, in knitting this gorgeous festive baby sweater and hat. Our festive KAL gives you a great opportunity to meet fellow knitters, learn new techniques, practice old ones and produce a beautiful baby set just in time for Christmas. – Receive a unique pattern (in stages) exclusively made for our KAL for free! 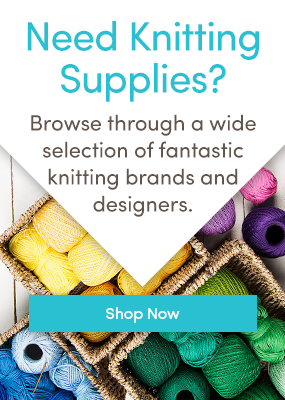 – If you’re a knitting looking to improve or take on a new challenge, it’s the perfect opportunity to receive tailored advice on new techniques every step of the way. – If you ever find yourself lost or in need of some extra help on any of the techniques, you can leave your queries in the comment box , where professional knitwear designer and teacher Monica Russel along with our own LoveKnitting experts will be on hand to give you their expert advice. – A chance to meet and chat with fellow knitters! – Proud of a technique you’ve mastered? You can share photos of your knitting with other knitters in the comment boxes. It’s free to join! Every week, we’ll publish a new part of the pattern along with tips and tricks to knit it, all you need to do is express your interest by signing up with your email address in the form below. By doing this you will receive weekly e-mails to let you know when the posts are available. The Knit-A-Long will begin next week with a guide to all the materials you will need to knit it, and as an extra bonus, I’ll be revealing an exclusive 10% discount, for those who sign up, on red and white yarns! What sizes will the pattern come in? The pattern will come in four different sizes; 0-3 months 3-6 months, 6-12 months, 12-18 months. The materials you will need will be revealed on 30th October, 2014. What level of knitter is this knit-a-long for? If you are an improver knitter and have the basics of knitting down then this is a great project for you. With tutorials and advice available every step of the way, it’s a great opportunity to take on a new challenge and learn different techniques. You can share your images on our Ravelry page too, where we’ll also be posting this KAL and offering advice. We’d also love to see your progress on our Facebook and Twitter pages, so don’t forget to follow us and share! If your thinking ‘I’d love to knit this, but there aren’t any babies in my life to knit for!’ Then why not knit it for charity? You can donate your knitted garments to Knit for Peace, a charity encouraging women and men from different, often historically hostile, communities to come together informally to knit, who will make sure they go to those in need. So what are you waiting for? Sign up now! We can’t wait to get started with you! Last updated: October 30th, 2014. I am also a sewing addict, an I hand and machine knit. This will be my very first KAL and it will be perfect for a new baby girl due to arrive December 18th! Can you tell me what sizes the pattern will be for? She also has a big sister who’s 27 months old. Matching sweaters for Christmas would be adorable :-). Thanks! Hi Pam , me too ! We are setting off on our 1st K-a-L adventure together ! I was wondering about sizing too. Hope you enjoy. Great to hear you will be embarking on your first K-A-L with me! The pattern will be available in four sizes: 0-3 months, 3-6 months, 6-12 months and 12-18 months. Next week we will reveal all the materials you need to get started. What perfect timing! The pattern will be available in four sizes: 0-3 months, 3-6 months, 6-12 months and 12-18 months. So a bit too small for her big sister! What a great sweater to use for donations to the hospital for the sick children to surprise their parents on Christmas morning. Thank You! I was thinking that this would be a wonderful charity donation, as well. Thanks so much for this KAL. Want to buy required yarn. What are the sizes and how much yarn is needed? Excited to get started! Thanks..
We’re all excited to get started too! The pattern will be available in four sizes: 0-3 months, 3-6 months, 6-12 months and 12-18 months. Next week we will reveal all the materials you will need for the pattern, you will get an e-mail alerting you to when this information is available. I need to make 2 of these for December babies! Just can’t wait to get started it sounds like a wonderful new challenge. I love the pattern. I’m going to upside the pattern to fit myself since I’ve no grand babies. I’m also an avid crocheter, cross stitching, sewing since 12 yrs, and a beginner quilter. I’ve been knitting & crocheting since 9 yrs, that’s over 50 yrs. I also have WIP afghans, several hats and scarves as well as slippers, both knit and crochet. This will most assuredly keep me warm for the incoming cold weather here in Nevada. Lovely idea! Perhaps you could share with other knitters during the K-A-L how you up scaled the pattern? I’m sure people would love to read. Your crafting skills are very impressive! We’re proud to have you with us during our first K-A-L. I am excited to do this. Will it be in the round. I am brand new to KAL, and do excited to start this project. Would love to order the yarn, how much will we need? I’m excited to get started too! We will reveal all the materials you will need next week, followed by the first part of the pattern a week later so that you have plenty of time to order your yarn. You will be alerted to when this information is available via e-mail, so make sure to keep an eye on your inbox next week! You are perfectly on time! The K-A-L starts next with an introduction to all the materials you will need, the first part of the pattern will be revealed the following week. Just make sure you have signed up in the form above so that you will receive alerts via e-mail. I am sitting on the couch in my daughter’s house, holding my first Granddaughter!! Would love to knit this for her first X-mas!! I don’t have any babies in the family to knit for but this will be a lovely pattern for charity knitting. Could we have a version with a more finished look to the neck and shoulders please? I have a new grand daughter and this would be lovely to make for her! I’d love to make that Christmas set for my Teddy since my girls aren’t babies any more then when they are mothers I’ll make one each for their first bubs. what level patterns are in this project. I have been knitting for many years, but I am still slow. This pattern is great for knitters who know the basics of knitting and want to take on a new challenge and learn more or improve their techniques. The great thing about the Knit-A-Long is that you’ll have me and other expert knitters here to help you if you have any questions. It’s no problem if it takes you more than 6 weeks, the pattern and all the tips on techniques will still be on the blog long after. Hope this helps! Lovely to hear you will be following along with us even thought you won’t be knitting. I’m sure it will be beneficial in case you decide to start at a later date. It definitely will be a lovely present! And lovely to hear you will be knitting for charity too. Can’t wait to start with you. I agree with Doreen. The neck and shoulders spoil this lovely pattern. Is there another version? I love this pattern, agree the shoulders and neck could be neater, and really hope the sizing will cover toddlers too! The pattern comes in four sizes, 0-3 months, 3-6 months, 6-12 months and 12-18 months. We hope you’ll be joining us but we understand the pattern might not be for everyone! We will have lots more K-A-L’s to come in the future if you’d like to try something else too. Knitting has never been a problem but the fiddling with sewing it together always ends in disaster. I hate things that require me to pick up stitches as I can never get them evenly spaced. Perhaps I’ll learn this time eh? Thanks for your comments, we will take this in to consideration when we come to the making up part. We’re sure we can get you sewing up expertly! This will be just perfect for my grandson on Christmas Day and still plenty of time to get it finished. Looking forward to knitting together!! This is so darling. I have never joined a knit along and am so excited to make this! I think the pattern looks just lovely. I like the neck because it looks very easy to put on….my granddaughter hates getting dressed. This will be my 1st KAL and I’m looking forward to it. What a great idea! I could make several for gifts! Can’t wait to get started. I have signed up, I just hope I have the correct yarn somewhere in stash ! Should I have received an email to confirm subscription ? Look forward to being a part of this group. Will knit this for my new grandson. Who will be 4 months by then… but a BIG four months. Thank you to Jenni and for the opportunity to join this site. Congratulations on the new grandson. The pattern will come in 4 different sizes from 0-18 months so this will be a great project for him! No problem! Can’t wait to start it with you. You can print them at your local library. Just pick up the email from their computer and print. They charge 10-20pence a sheet of A4. Yes DK will be used, but we will reveal the exact details of the materials this week. If you have signed up in the form above, you will receive an email alerting you to when this information is available. Jeanette has offered some great advice, local libraries are a good place to print if you do not have printing available at home. Really looking forward to doing this, just hope the pattern goes up to a 22″ chest my one year old granddaughter has gone from 5lb to 24 in the year! I would love to do this for her for Christmas. Thank you all for the opportunity, being housebound it will be good to know I am sharing with at least 50 others! There will be four sizes available from 0-18 months with width sizes starting at 22cm going up to 29cm, so it will be perfect for your granddaughter. Look forward to starting with you! I love this and will hopefully do it for my grandson for Christmas, along with everything else I have to do! I have been knitting for years, but I never made clothing as I was always afraid I would mess it up. I look forward to learning this new skill. This is definitely a great place to start! If there is anything you are not clear on or need particular help with, you can leave your questions in the comment boxes throughout the K-A-L posts. Good luck and enjoy yourself! Yes this week we will be revealing all the materials you will need for the K-A-L, we will send you an e-mail when all this information is available if you have signed up with your name and email address in the form above. We will be posting all the information for you to get started this week and yes you will receive a lovely email letting you know when it’s available! I am looking forward to seeing patterns for my grandkids, as well as for myself. I can only get wool but no patterns. I like the thought of knitting things that no one else has got. I love knitting. Now that the winter is creeping in I prefer to stay and knit. It’s so lovely to see unique patterns isn’t it? You might like to have a browse of the patterns by our independent designers, there is a great collection of truly one of a kind patterns: http://www.loveknitting.com/independent-designers. I’m with you on that! It’s great to curl up and knit in the warmth of your home. Look forward to starting with you! You will receive your first e-mail notifying you when the first blog post is available this week. The first blog post will have information on all the material you will need to get started. Looking forward to getting started with you! Beautiful pattern. Bet it even looks nicer on too. First time joining a knit along. Yes, I am excited because it is such a beautiful pattern. Looking forward to this challenge. Thanks Love Knitting. I’ve signed up and looking forward to the challenge, but do I have to create an account to be able to take part? No need to create an account, you will be able to see all the posts for the KAL in this category here: http://blog.loveknitting.com/category/knit-a-long/. As you are already signed up to the blog, you’ll be able to leave comments just as you have here if you have any questions. You will also receive more emails with updates when the blog posts are available. I have just signed up and can’t wait to get started. I will be making it for a baby that will be born Dec. 1. I think the set is so cute.! Thank You. My first knit along. My second grand child will be born in December and this project would be perfect. My new grandaughter is just 3 weeks old and this will be a perfect first Christmas outfit for her! I’m ready to start so where is the pattern? Can”t wait…….. The pattern will be available on 6th November, 2014. If you have signed up, you will receive an email alerting you to when the blog post is live. I tried to sign up but it won’t let me am I too late? You’re not too late, you can still sign up and the KAL will start this Thursday 6th November, 2014. You will receive an email when the first part of the pattern is available. Where can we find the pattern? Hi Jenni, I just realized that Loveknitting is in the UK, will I have enough time to order from across the pond. I could always do a trial run. Sorry I seemed to have missed your comment! Where are you based? I will always be here (in future) to help if you need to catch up! We will reveal the first part of the pattern this Thursday 6th November. The tutorials, comments and parts of the pattern will stay live. Today is the 28th! I’m all ready!! where is my first lesson!!! It is after 6 thirty PM !! The first part of the pattern is not being revealed until 6th November 2014. The materials were released last week, which you can find here: http://blog.loveknitting.com/christmas-knit-a-long-an-introduction-to-materials/. Have you signed up? You should have received an e-mail, but I can double check that we have got your details in order so that you will receive our updates. Can’t find the first lesson. The first lesson is being revealed on Thursday 6th November, 2014. Can’t wait to get started! Looking forward to trying this. Just had a grandbaby last Tuesday, 10-21-14 and would like to see if I could knit this for her for Christmas. Am excited. When will I receive the instructions? I signed up again today (the 28th) because I had not received an email or instructions. Do I need to go on another site? You should have received a welcome e-mail from us last night with confirmation of your sign up, it may be that the email when into your spam or junk folder, so please do have a little check. Let us know if you still cannot see the email from us. We will be kicking the KAL off this week with all the materials you will need so you can just check back on the blog as well to see when it’s available. I would love to knit this in time for Christmas for my baby granddaughter! Just a beginner knitter will this be too hard for me? If you have the basics of knitting under your belt and are looking for a new challenge, then this could be a great project for you to improve your skills. We will be knitting alongside you every step of the way and will be offering tutorials and tips. If you find yourself needing some extra help you can comment like you have here and myself, Monica or our expert knitters at LoveKnitting will be on hand to help! Would love to knit this for our new little granddaughter. Like Jo Ann I haven’t received anything, I’m worried… Should I sign in again ? Can`t wait to knit this for my new granddaughter …. excited ! …. I did not receive my material list yesterday. could you please resend. Super excited to knit this! Can’t wait to get the first email! No sign of the list of requirements yet, hopefully there are no hiccups with it all as Im really excited! I just dont want a panic to get the yarn so would really appreciate knowing what is needed asap! I also have not received my email yet with the materials list. I checked my Spam and it is not in there either. I signed up for the KAL yesterday and haven’t received anything yet. I did check my junk folder and nothing there either. I am looking forward to the project, it is adorable!!! Mildly concerned about ordering/receiving materials timely as I am in California, USA. Any thoughts? If your yarn does not arrive within good time, there is no need to worry as we will be here with you every step of the way, whilst you catch up. In a slight panic as i have not received materials yet. I live in Australia so i know it will be slow getting my wool. some help on fair isle bit. Thanks for the concept. Am most excited! No need to panic, you can find the materials here: http://blog.loveknitting.com/christmas-knit-a-long-an-introduction-to-materials/. You should also receive an email today with an alert to that blog post. We won’t post the first part of the pattern until next Thursday so it should be fine, but if your yarn does not arrive in time, don’t worry, I will always be on hand to knit with you and help any other day until you catch up for the following week. How exciting, any chance of scaling the pattern up for a 3 to 4 year old? So sorry about the delay in posting the materials – we had a few teething issues, if you have signed up you should have received a welcome email explaining that we would be posting them later in the week. But, great news! We have now posted the blog post for all materials you will need, which you can find here: http://blog.loveknitting.com/christmas-knit-a-long-an-introduction-to-materials/. You will also receive an email alerting you to this. We hope you still have faith in our Knit-A-Long and will be joining us in the fun! Thank you so much for your patience, we had a few problems which delayed us from revealing the materials but we have just posted them on the blog and you will soon receive an email alert linking you to it. However you can see it now here: http://blog.loveknitting.com/christmas-knit-a-long-an-introduction-to-materials/. I haven’t received an e-mail either. I have never knitted a sweater and do not want to be behind. Please give us an update. Thank you. I have been checking all my in boxes,including junk mail for 3 days without any success. I have also registered 3 times but still have not received any information about materials. Can you please help? Next Thursday will be when the first part of the pattern is available, can’t wait to get started! I am in the same boat as Julie (beginner knitter) and also same boat as Barb, haven’t received an email about pattern for the sweater or materials required etc. The next part of the Knit-A-Long will be posted next Thursday and will be avilable here: http://blog.loveknitting.com/category/knit-a-long/ So if you’re concerned that you haven’t received an email you can always see if the next post is available there. Like others who have not received a material list or instructions I am wondering what to do? I live in Canada and it usually takes one to two weeks to receive my wool. Time is marching on; I don’t want to be scrambling to keep up with the group. I find it strange that we are not getting a follow-up. How long does it take to post a comment on the blog updating us? I am also wanting to send another order but am waiting for the material list for this one so that I can save on shipping costs. The first part of the pattern will be available next Thursday, but I will always be on hand to help you in future and will be checking the comment boxes daily, so do not worry about being behind. I hope this has cleared everything up and I look forward to knitting together. To all who have not received an e-mail…I was looking at the blog again and at the top right side there is a post about the materials we need posted today. Hope this helps. I want to make the knit along project. When will I get the first part of the pattern? That’s great to hear you’d like to join us on our Knit-A-Long. The first part of the pattern will be revealed on Thursday 6th November, if you have signed up, you will receive an email alerting you. When will I get the first part of the pattern? Have fun, and don’t forget to let us know how you’re getting on! Hello, I would love to join the KAL, but I’ve got a very big 14 month old – how generous is the 12-18month jumper? As there is no ‘ actual size’ given, you’ll need to do a bit of maths and work out, if you knit to the right tension, how big the front will actually be (22 St = 10cm so largest size should measure ? ) and see if it is larger, the same, or smaller than the measurements given (technical speak it’s called ‘ease’ and denotes if a garment is snug, fitted or loose) and then measure your child and compare. Soheiwillget theatternwhenit is meant to come out this week? Is the chart correct? Have adjusted to get 6 sts either side of the contrast on first row. For the smallest size. Chart shows just 5sts at the beginning of the first row, I counted it out and realised it was out. I’ve changed the instructions a little for my own use. Decided I could do this in the round vice flat. So now I’m read for the rest of the directions I.e., the front and sleeves. Can’t wait, as I am making this for our first great grand child for Christmas and it needs to be shipped off. Finished the back and front with no problem until I cast of the 9 center stitches. With that part completed, the next two steps are a bit confusing. Help. Hi Sherri! I was so happy to receive the revised part 2 of the pattern so I could continue my (2) sweaters (0-3 and 12-18). But now that I’m at the c/o at the neck I’m confused as well. I’m probably not reading the instructions correctly but could use some clarification. After the initial neck c/o of 9 stitches do I complete the row and the following row (wrong side) “in pattern” before continuing the 2 stitch c/o on the next right side row? Then do I also continue “in pattern” until the remainder of the c/o stitches are complete before I continue in ST st? For some reason the remaining stitches I have to c/o on the last shoulder row isn’t correct. PLEASE HELP! Thank you…..love the sweater:-)!!! I am waiting to see the answer as I too am confused! Thanks for explaining so well! Thank you for your interest in the KAL. Sorry to hear you have a loved one in the hospital. I hope you can start knitting this sweater to pass the time. The second part will be posted on Monday morning, so you’ll have lots to get started on. I too am confused on the row where you bind off the 9 sts. I am waiting to see the answer as others are confused as well. Thank you.